Need to show up to a party or tailgate with minimal notice AND you’re expected to bring some sort of sustenance for others? Don’t you fret. I’m here to help. 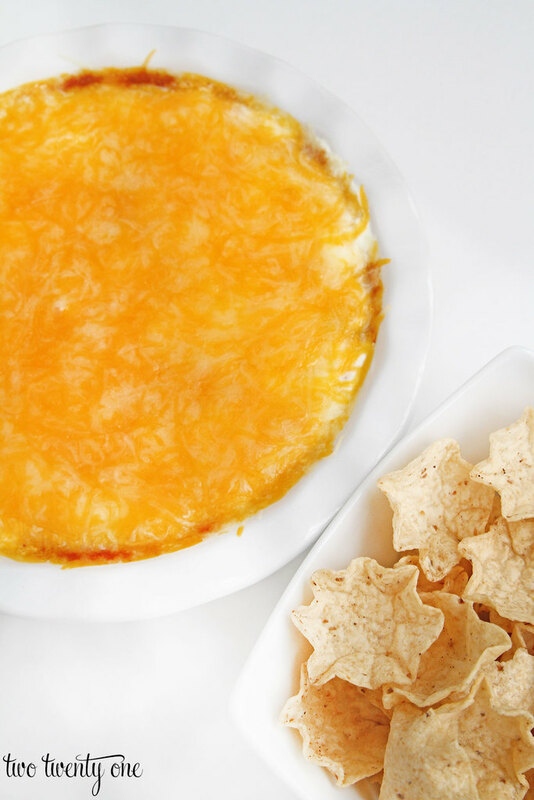 My mom always made this chili cheese dip for get-togethers when I was younger. It’s basically the perfect dip because there’s only 3 ingredients and it’s ready in under 10 minutes. And by 10 minutes I mean, get everything out, make the dip, and put everything away. This dip is so good that when Owen saw Brad and me eating it after I took the photos for this post, he started saying “Dip! Dip! Dip!” We gave him some, and he proceeded to pack it away like a 300 pound linebacker. I ended up having to lie to him and say it was all gone because he wasn’t showing any self-control. Guys, I even made a video showing how to make this dip. In case you missed this Facebook post, bloggers are now expected to be videographers. Do me a solid and spend 1 minute watching it and marveling at my major motion picture-worthy skills. Also, if this blogging gig doesn’t pan out, I think I have a strong chance of being a hand model. Did you watch it? I should win an Oscar, right? 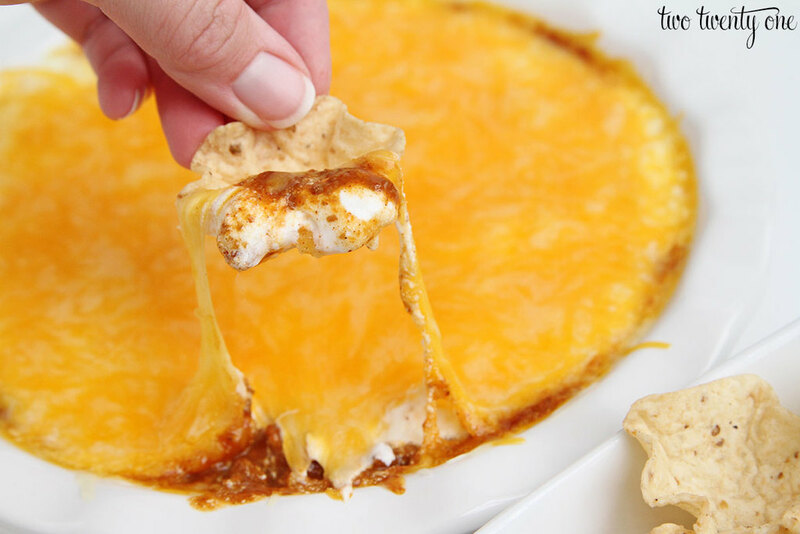 Ok, here’s the recipe for the world’s easiest chili cheese dip. Spread the chili in a pie plate, or similarly sized microwaveable dish. Spread sour cream on top of the chili. Top with shredded cheese. Microwave on high for 4 minutes. Don’t have any sour cream in your house? Check out this similar recipe that uses cream cheese instead of sour cream. I’ve partnered up with some other awesome bloggers to share some delicious tailgating recipes. So make sure you head over to their blogs and check out their tasty creations! My Aunt used to make a similar dip all the time, and I forgot about it until today! Her recipe was just like yours except she used cream cheese instead of sour cream, and put the cream cheese on the bottom of the pan and layered up. Easy peasy! The video is Great!! And so is the dip! Love the video and yes, you could be a hand model!! Dip looks very good. Pinned it! Like the video! Looks like the dip would be very good with the scoop chips! Also like the peanut butter balls. I make them every Christmas for the family. Grandsons request them!! You always give us good ideas! So simple and it looks absolutely scrumptious! Can’t wait for football season to try it…I may have to sample it ahead of time, cuz I won’t be able to wait! I love simple recipes like this! My family would enjoy eating this while we watch football games. Thank you for linking up at the #HomeMattersParty this week! Oh man! This looks amazing!! It’s on my football snacks list for sure.